It’s almost May! (Didn’t April just begin??) I’m not complaining, mind you. I am more than ready to end the showers and welcome the May flowers. May also brings May Day, which was one of my favorite days when I was younger. When I think of May Day ideas, I think about the basket I used to make every year. It took me at least a week to get it just right. I would then fill it with little candies, flowers, miscellaneous toys that I found laying around the house, and sometimes a couple of my pennies (which I worked so hard at getting). I would take my lovely basket and hide in our bushes, making sure my neighbor couldn’t see me, and then run as fast as I could to ring the doorbell and then back to my hiding spot in the bushes. I’d peek through and watch her open her door and find the basket sitting at her feet. She’d be so surprised every year and say, “Oh my goodness, isn’t this beautiful!” She would smile and so would I, and then I’d run back to my house and tell my parents about it. That was such a great feeling. May Day ideas can be so much fun. 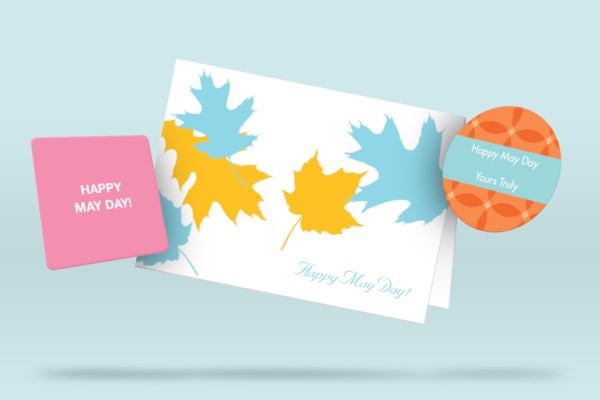 Get creative and use gift tags as stickers to put on a jar of jam or on a small bag of candy and don’t forget to include a note card saying “Happy May Day!” Any activity involving candy is a big hit with kids, of course, but the secret delivery is the best part. It’s such a fun surprise to leave a little basket with flowers or candy for someone you love.